Previously, email marketing was a massively powerful tool, and done correctly, brought in huge revenues in the right hands. But what if we told you there was a tool, freely available, that can deliver up to and beyond 240% increase in Open Rates on consumer conversations. Facebook Messenger has over 1.3 Billion users with 50 minutes a day being the average use duration. Given the size of this landscape we find it interesting that only 60 Million companies are using Messenger Globally. To then give you the idea of the level engagement this tool can have, there are 8 Billion messages sent monthly between business and customers. To give you an idea of the power of this tool, please see the below table detailing the results collected from the group who opted in. Hubspot, in the below example, offered their leads the potential to declutter their email inbox and only receive marketing material through the messenger. Help prospects understand what you do and how you can help their needs. Create interactive stories and content to engage your prospects. 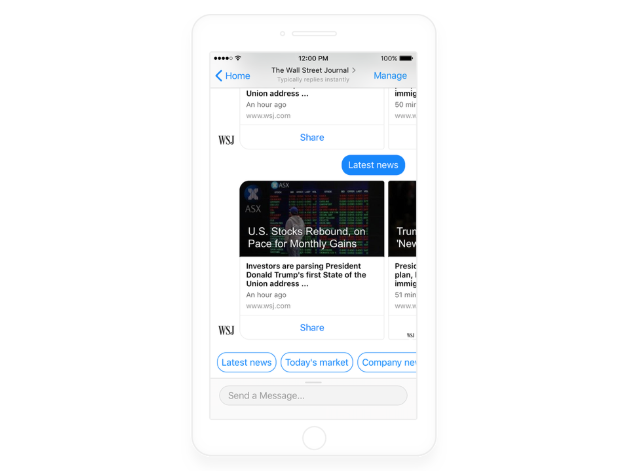 The global news organization created a Messenger bot that gives people access to the Journal’s daily information digests, breaking news and live markets data. The bot helped WSJ engage a younger audience and introduce its world class journalism to new readers around the world. The result of the above medium change was 130,000 daily active users in the first 14 months of implementation.